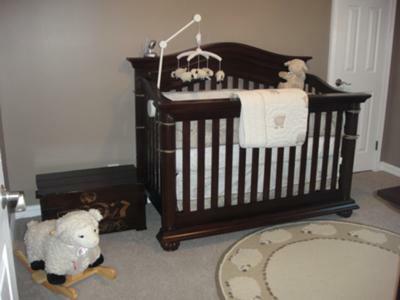 Our sweet lamb nursery theme was a room that was used as our office previously. To transform it from its function in its earlier life and into a room for the baby my husband gutted all of the plastered walls, knocked out an old window and basically started from scratch. He began by insulating the room to make it more comfortable and quiet. Then he hung sheet rock in the room using fireproof sheetrock for our little bundle of joy's protection, put in a new window, gutted the closet and made it into a cedar closet. Then we had carpet installed after the many long hours it took his pregnant wife (me) to make a decision on what color to paint the room and what color carpet would be best for our baby's lamb nursery theme. The end result is the picture perfect lamb baby nursery theme that I had always dreamed it would be complete with crown molding and a custom radiator cover made by my husband. He really put his all into designing a special room for our baby and I am very appreciative to have such a wonderful husband. From the pictures of your sweet lamb nursery theme, I would say that your husband did a fantastic job. I love that he not only was interested in the decorative features but did it right with the insulation and fire-proofing. Congratulations on the birth of your bundle of joy from Unique Baby Gear Ideas. This is such a cute nursery but I would love to see a little pop of color around the room to brighten it up. Everyone's taste is different and it is a precious space. Please share where you got this rug! I also have been looking everywhere for it! Please can you tell me where you got the lamb mobile.. Yes, please share where you got this rug! I also have been looking everywhere for it! Hi I am wondering where you can get the lamb rug that is in this picture. I have been looking everywhere! Could you please post where you got it or the name of the rug? Hi can you please send me an email at mmmetz at hotmail.com I would love to know where you got the bedding, mobile and rug thanks! Yes, would love to know where you found the lamb rug! Where did you find the lamb rug? Join in and write your own page! It's easy to do. How? 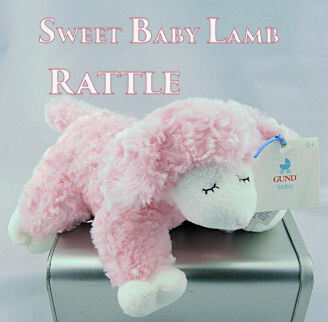 Simply click here to return to SHEEP or LAMB NURSERY THEME PICTURES and DECORATING IDEAS.